Unreal Editor supports source control, allowing teams to coordinate their game development and design efforts, as well as handling version control. 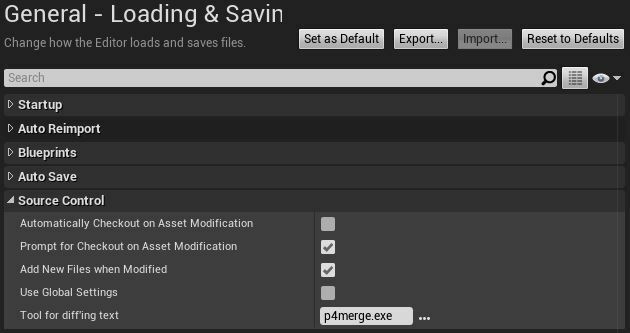 Perforce and SVN are supported by default. In the Level Editor's Preferences window. You can activate source control via the editor's main Preferences window (Edit > Editor Preferences > Loading & Saving). Automatically Checkout on Asset Modification When checked, this will automatically check out any asset that has been modified. Prompt for Checkout on Package Modification When checked, a prompt will appear when you make changes to a source controlled-package, asking if you would like to check out (lock) that package. Add New Files when Modified This will add new files into source control when they are modified. Use Global Settings Use global source control login settings, rather than per-project. Changing this will require you to login again. Tool for diff'ing text Specifies the file path to the tool to be used for diff'ing text files. You can also activate Source Control in the Content Browser. To do so, right-click any asset or folder. At the bottom of the context menu, in the Source Control section, click Connect to Source Control. This will open a log-in screen where you can select your source-control system and enter any appropriate settings and other information. Enter the appropriate information, and click Accept Settings. After source control is activated, the display of the assets in the Content Browser will change to reflect their source-control status, and some source-control options will be included on the right-click context menu. Check Out Checks out (locks) the asset for editing. This prevents other users from editing the asset at the same time. Refresh Refreshes the source control status of the asset. History Gives a revision history list of the selected asset, allowing you to see previous edits. Diff Against Depot This allows you to check the asset against the version currently stored in the source control depot. To check out an asset for editing, simply right-click it and choose Check Out. However, when checking back in, there is a certain protocol which must be followed. Right-click on the asset and choose Check In. A dialog will appear with a required changelist description for the check-in. Enter a description, which will be added to the asset's revision history. A changelist description is required, so the OK button will not be enabled until a description is entered. You may find that you want to deactivate source control after activating it. Only use this option if you are absolutely certain that you do not want to use source control. Deactivating source control will put your content out of sync with your source-control system, and will make it impossible to check in changes. In the upper-right corner of the Level Editor window, click the green, double-arrow icon ( ). This brings up the Source Control Login screen. Click the Run Without Source Control button. The green icon in the Level Editor window changes to a red circle with a slash ( ), to indicate that source control is not being used.